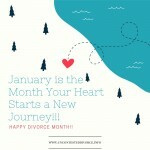 1. the first working Monday of the New Year is called “divorce day” by many family law practitioners. 1. the first Month of the Year is called “divorce month” by many family law practitioners. This is because there is are a lot of divorces filed in January.